Casimir Pulaski Day. If you grew up in Illinois in the 1980s or 1990s (or, if you raised a kid at the time), you probably remember a school and government holiday — the first Monday in March — that most of the rest of the country does not observe. We let Nic, a history buff, take a crack at an answer. He guessed that Casimir Pulaski Day came about as an expression of Polish-American pride, maybe in the 1970s or 1980s. Nic’s on the right track, but the details make the story worth telling. Just consider what was working against the state holiday: Casimir died more than two hundred years ago, he never set foot in Illinois, the community that adored him arrived in Chicago nearly a century after he died, and, it turns out, he’s not even the most famous Polish-American war hero. The story behind this most “Illinois” of holidays involves Casimir, of course, but it’s more of a story about a strong community that was willing to spend political capital to honor him. Let’s start with Count Casimir Pulaski the man. He grew up in the struggle of Polish patriots against the neighboring powers that sought to annex or assert control over what was at the time the Polish-Lithuanian Commonwealth. By the time he was 22, he was fighting against the new Polish King Stanislaw II, who was seen by many as a puppet of the Russians. Pulaski became an important cavalry officer in a series of wars. But by 1775, the conflict had gone badly for the Polish patriots, and he was exiled to France. There he met the Marquis de Lafayette and Benjamin Franklin, who recruited him to come to America, to fight in the Revolutionary War. Columbia College historian Dominic Pacyga says Pulaski considered the American Colonists&apos; fight for independence from Great Britain as similar to Poland’s own struggle for independence. Above: Click on the painting&apos;s hotspots to hear about the artist&apos;s motifs. Analysis comes from experts at The Polish Museum of America. Painting: Brigadier General Kazimierz Pulaski mortally wounded at the battle of Savannah on the 9th of October 1779 by Stanislaw Batowski Kaczor. George Washington and other Colonial leaders were skeptical of these European idealists because not all of them lived up to their billing as great soldiers. But Ben Franklin helped Pulaski by writing a letter of recommendation to George Washington, describing the Pole as “… an officer famous throughout Europe for his bravery and conduct in defense of the liberties of his country.” Although the Continental Congress wouldn’t approve a commission, Washington allowed Pulaski to enlist informally. Casimir Pulaski then proved himself at the Battles of Brandywine and Germantown, and George Washington named him a Brigadier General and the first Commander of the American Cavalry. At first, American soldiers balked at the idea of fighting under a “foreign” officer. So, in March of 1778, Congress organized the Pulaski Legion, which was made up of mostly “foreign” soldiers — Colonists and volunteers from France, Germany, and Poland. Pulaski’s Legion turned the tide at the skirmish at Egg Harbor, New York. In May, they drove the British out of Charleston, South Carolina. But just a few months later, Pulaski died from a mortal wound he received in Savannah, Georgia. In the Early Republic, Pulaski was remembered as a Revolutionary hero, alongside his friend, the Marquis de Lafayette. Several new towns and counties were named “Pulaski” in his memory. Pulaski remained a great hero in his homeland as well, a sentiment that wasn’t forgotten when Poles began arriving in the United States. If Pulaski hadn’t had a community that respected his achievements, who knows if there would have been Casimir holiday. By 1800, the independent Polish state had been divided between Russia, Austria, and Prussia. Poles began immigrating to Chicago in the 1860s as economic refugees from lands where they were ethnic minorities and often disenfranchised. White Anglo-Saxon Protestants saw themselves as the “real” Americans, and they did not always welcome Poles with open arms. “They are from the other Europe. They have the names nobody can pronounce, they’re not Protestants. There’s a good deal of anti-Polish prejudice at the time,” Pacyga says. Because of this, he says, Polish Americans used Casimir Pulaski — alongside the other Polish revolutionary hero, Tadeusz Kosciuskzko — as a symbol that Poles had contributed to the American Republic from the very beginning. As early as the 1930s, Polish Americans in Chicago lobbied for public recognition of Casimir Pulaski. Their first major victory was a declaration, in 1933, that the former “Crawford Road” in Chicago would now be “Pulaski Road.” According to Dominic Pacyga, many of the merchants and the shopkeepers in the area were not happy about the new name. “They have to change letterheads, they have to change addresses, they have to mail out letters saying they’re no longer on Crawford Road.” For more than a decade, the issue remained contentious. Above: Local historian Dan Pogorzelski says there&apos;s no statue of Casimir Pulaski in Chicago, but there are still places to find the Polish war hero around the city. Here are a few of Pogorzelski&apos;s suggestions. Anything missing? If you&apos;ve spotted Casimir somewhere else, write us at curiouscity@wbez.org and we’ll add it to the map. The Polish-American community that remembered Casimir so fondly did everything it could to get the political system to recognize him. The persistance paid off. 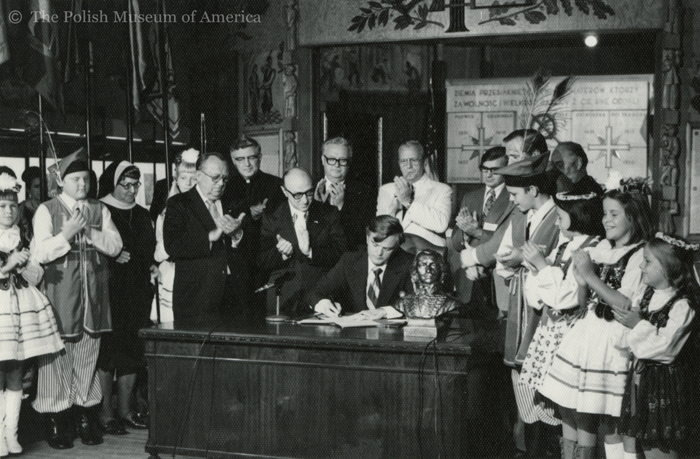 In the 1970s, the Polish American Congress in Chicago took up the cause of a statewide Casimir Pulaski holiday. In 1977, they succeeded in getting a law passed designating the first Monday in March “Casimir Pulaski Day.” This was only a commemorative day, meaning Illinois schools, public offices and banks stayed open. The lobbying efforts simmered for years, and gathered momentum again in 1985 when State Senator Leroy Lemke introduced a bill in the Illinois Senate to make Casimir Pulaski Day a full public holiday. It would give public schools and some government offices a day off, at the governor’s discretion. Speaking in support, Senator Thaddeus Lechowicz cast the law as part and parcel of the ethnic pride movements increasingly common in American cities. “Every ethnic group, every racial group has a person or persons they that they see have contributed to an extra degree in making this country great. ... Casimir Pulaski fills that need for Polish Americans,” he said. Retired State Senator Calvin Schuneman still remembers how the debate played in 1985. At the time, he raised concerns about the holiday, and thirty years later, he has the same concerns. “If it’s going to be a state holiday where government offices are going to be closed and schools are going to be dismissed, I think we have enough of those holidays.” For Schuneman, who represented portions of western Illinois, this was a matter of Chicago politicians pushing something that didn’t make sense for the rest of the state. The law did pass, though, and Governor Jim Thompson fulfilled the terms of the bill and declared a public school holiday across the state. Some municipal offices chose to close in honor of Casimir Pulaski, as did some banks. 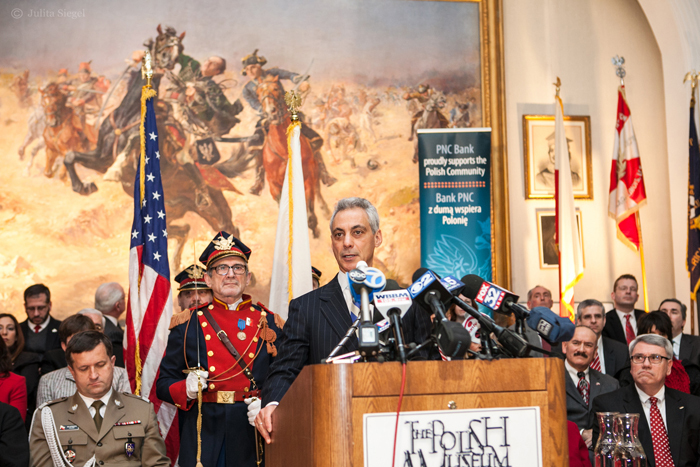 That freed many people up to visit the Polish Museum of America on Pulaski Day. The ceremony is always held in front of the centerpiece of the Museum’s Great Hall: a fifteen- foot-wide painting of Casimir Pulaski, painted by Stanislaw Batowski. It depicts Pulaski’s mortal wounding at Savannah. While memory of Casimir Pulaski is alive and well at the Polish Museum of America, his holiday has been chipped away in the state’s public schools. In 1995 the legislature made Casimir Pulaski Day optional. Individual school districts in Illinois could apply for a waiver to opt out. Downstate districts were the first to seek waivers. By 2009, 74 percent of the districts chose to keep school open on Pulaski Day. And in 2012, Chicago Public Schools dropped Pulaski Day during negotiations between Mayor Rahm Emanuel and the Chicago Teacher’s Union. But historian Dominic Pacyga says, while it might be a shame to lose the holiday, it’s also part of what always happens with ethnic immigrant culture in America. Nic Levy, who asked Curious City to investigate Casimir Pulaski Day, agrees with Pacyga’s take that the loss of the holiday is just part of how history works. 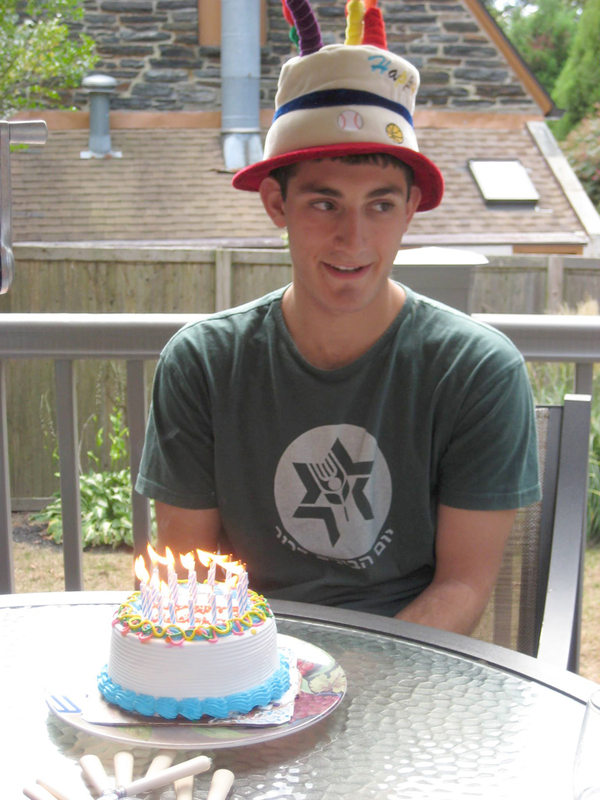 Nic does feel that having memories of Pulaski Day is something that will define his generation in the decades to come. He enjoys thinking about how history affects geography, as in how the contributions of a Polish nobleman in the 18th century, could change the name of a Chicago road in the twentieth. He’s studying geography now, at McGill University in Montreal. He says his interest in geography and history began as a teenager in Chicago, right when he started driving. He used maps to plan routes, and was fascinated by the names of the streets, Chicago’s orderly grid plan, and the way the grid intersected with the geography of the river, canals, and the lake. Jesse Dukes is Curious City’s audio producer. Correction: An earlier version of this story misspelled the name of the managing director of the Polish Museum of America. The correct spelling is Malgorzata Kot.